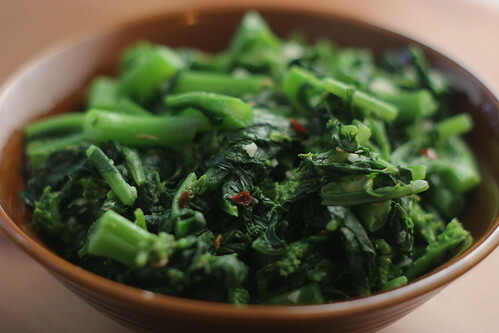 Broccoli rabe is one of my current favorite vegetables. The stems, leaves, and florets are all edible, so you get a variety of textures. I didn't like it much the first few times I cooked it, but now I've found a method that I love. I chop it up from stems to florets and then blanch it until the stems are tender. Then I saute it really briefly - only a minute or so - with some garlic and red pepper flakes, and add some lemon zest to finish. p.s. This is my 100th post! I'm going to give myself a little public pat on the back for that accomplishment. I suppose I could have celebrated by baking and blogging about a cake or something, but I think it is appropriate that I'm talking about a seasonal vegetable instead. Bring a large pot of well-salted water to a boil. Add broccoli rabe to the pot and boil for 4 minutes, or until stem pieces are tender, then immediately drain into a colander. In a wide pan, heat a splash of olive oil over medium heat and saute garlic and red pepper flakes until fragrant, about 30 seconds (the wide pan makes it easier to toss the ingredients together, but you can reuse the pot that you used for boiling if you want to minimize cleanup). 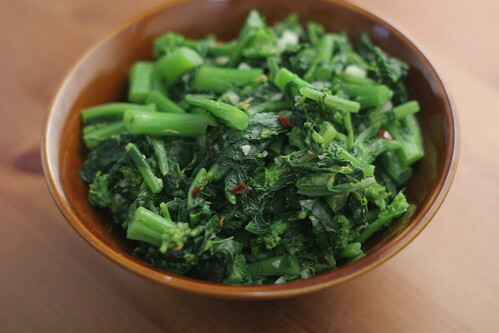 Add broccoli rabe and saute for about 1 minute. Remove from heat, stir in lemon zest, and salt to taste (I find that this dish does not really need added salt).